In general proteins of similar sequence have a similar structure. We investigate whether a similar correlation exists between sequence identity and domain-domain interaction similarity. Understanding this relationship is important to the study of many aspects of protein-protein interactions, for example, the prediction of interaction information based on homology to complexes observed in structural data. Here the relationship between sequence identity and interaction similarity is investigated with the inclusion of all interactions within a structure and with redundancy filtering based upon normalisation by the pairwise SCOP  family classification of the interacting domains. Domain-domain interactions were employed rather than protein-protein interactions as domains can be considered to be the fundamental functional and structural unit of proteins. SCOP  was chosen as the domain classification system. The domain-domain interactions where again obtained from SNAPPI-DB (Structures, iNterfaces and Alignments of Protein-Protein Interactions – DataBase) . The problem of interactions due to crystal packing artefacts was reduced by use of biological units, as predicted by PQS . Domain-domain interaction orientation was determined using an implementation of the iRMSD method described in Aloy et al . The sequence identity between two domains was obtained from the STAMP  alignment output. The probability that a pair of interactions were observed at the same orientation was determined and plotted against their sequence identity. The results were normalised by the frequency of the pairwise SCOP  family classification. 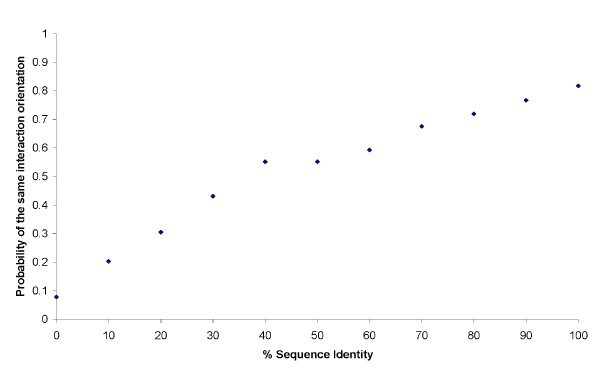 There is a positive correlation between the probability of the same orientation between a pair of interactions and their % sequence identity (Figure 1). The probability that a pair of interactions are interacting at the same orientation against sequence identity. Even at high sequence identities domain-domain interactions have approx. 20% probability of interacting at a different orientation. Emily Jefferson is supported by a BBSRC (UK Biotechnology and Biological Sciences Research Council) studentship.